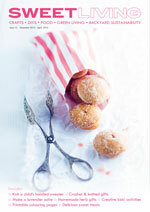 From Jenny Occleshaw’s gorgeous new book Made For You, these sweet little slippers are perfect for a special occasion. With their little ties, lacy edging and embroidered rose they would make a beautiful addition to a christening outfit. Jenny Occleshaw’s cute little book includes 50 knitting, crocheting, embroidering and needle felting projects for babies, young children and adults, including gloves, socks, blankets, brooches, tea cosies and bags, hats and hair clips. There’s a section on essential techniques, a stitch directory, and knitting and crochet conversion charts, and ideas for upcycling favourite objects such as beads, glass, lace and heirloom materials. A book for beginners and more experienced crafters alike. 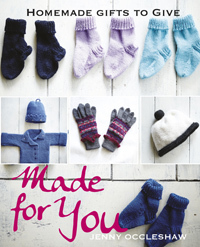 Extracted with permission from Made for You: Homemade gifts to give by Jenny Occleshaw with photography by Natalie Hunfalvay, published by New Holland, $34.99. Using two 2.25 mm (US 1) double-pointed knitting needles and 4-ply yarn, cast on 7 sts. Row 3: K1, inc in next st, knit to last 3 sts, inc in next st, K2. Rep rows 3 and 4 until there are 15 sts. Cont in garter st (every row knit) until work measures 6.5 cm (2. in). Next row: K1, k2tog, knit to last 3 sts, k2tog, K1. Rep these last two rows until 5 sts rem to complete the sole. Round 2: K25, k2tog, K8, sl 1, K1, psso, K25. Round 6: K23, k2tog, K8, sl 1, K1, psso, K23. Round 8: K22, k2tog, K8, sl 1, K1, psso, K22. Round 10: K21, (k2tog) 3 times, (sl 1, K1, psso) 3 times, K21. Round 12: K18, (k2tog) 3 times, (sl 1, K1, psso) 3 times, K18. Round 14: K15, (k2tog) 3 times, (sl 1, K1, psso) 3 times, K15. Using 3 mm (US 11) crochet hook and 4-ply yarn, make a length of chain, (in multiples of 3) long enough to go around the opening of the slipper, plus 2 extra ch. Row 1: 1 dc, into second ch from hook, 1 dc into each ch to end. Row 2: 1ch, 1 dc into first dc, *5ch, miss 2 dc, 1 dc into next dc, rep from * to end. Row 3: 1ch, (3 dc, 3ch, 3 dc) into each 5ch sp to end. Fasten off. Darn in loose ends and press flat with warm iron under a damp cloth. Do not stretch. Stitch edging in place around the opening of the slipper. Using 2.25 mm (US 1) double-pointed knitting needles and 4-ply yarn, cast on 3 sts. Row 1: *K3, do not turn, slide sts to other end of needle, pull yarn firmly behind work, rep from * until I-cord measures 45 cm (17 in). To cast off sl 1, k2tog, psso, fasten off. Fold in half and stitch fold to back of slipper. Using three strands of embroidery cotton, make a bullion knot rosebud on top of instep. Using medium pink, place two 7-wrap bullion knots parallel to each other. Make five light pink 9–11- wrap bullion knots around these, central knots, overlapping the knots slightly in the same way that petals overlap.